The Official Programme for the Royal Wedding of Prince William and Miss Catherine (Kate) Middleton is now available for the public to download for free. The Official Royal Wedding Programme will also be available for free electronically in two formats: as a page-turning Ceros PDF (using Flash) and an iBook compatible with Apple products, which can be downloaded from the Apple iBookstore. 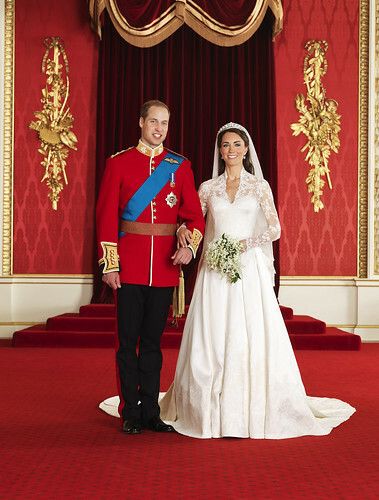 The programme includes the full Order of Service (as used by guests in Westminster Abbey), a personal message of thanks from Prince William and Miss Middleton, and a photo of the Couple taken by photographer Mario Testino at the time of the Couple’s engagement. The Official Programme features Prince William’s recently updated Coat of Arms on the front cover and Catherine Middleton’s new Coat of Arms on the back cover. St. James’s Park – Marlborough Gate, North Horse Ride, Storeyard Triangle and Queen Anne’s Gate, as well as four mobile sales units around the park. Green Park – Green Park Underground Station, as well as two mobile sales units around the park. Hyde Park – Speakers Corner and at the Fun Fair, as well as two mobile sales units around the park. Trafalgar Square – opposite South Africa House, as well as one mobile sales unit opposite Canada House on Cockspur Street. On the wedding day, 150,000 copies of the programme will be sold by 60 Explorer Scouts and 80 Cadets (supervised by adults) for £2 per copy at locations in Green Park, Hyde Park, St James’s Park and Trafalgar Square. Profits from the sale of the Official Programme will go to benefit The Foundation of Prince William and Prince Harry. so how do you actually download it? Like Lisa before me, I am nowhere near Trafalgar Sq. on the day... Though I would love hardcopy. What can a foreigner do? There isn't currently the functionality to download the online version of the Royal Wedding programme, we'll advise if/when this changes. We will also investigate whether it will be possible to purchase a hard copy of the programme for those not able to be in London on the day. We'll advise how to purchase a copy if it is possible. where do you the program. The electronic pdf version is not printable. I would like to purchase a hardcopy to for my mum as she has no access to a computer. Thank you. I too am not in the UK; I am in USA and would LOVE to purchase 6 hard copies of the programme for myself and family members. PLEASE post any info. if this becomes available and how to go about it! Thank you!! Any further information on purchasing the Hard copy of the Programme. I am in the USA and I know a lot of people who do not have computers and would love to have the actual programme not a printout. I think it would generate a lot of funds for the charities.